Originally published in 1991, Origins and Species seeks to understand the historical origins of Darwinism. 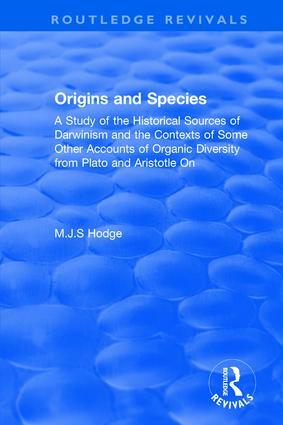 The book analyses the explanatory problem of species variation to which Darwinian theory was a response, while contrasting the Darwinian with other traditions of the time, in the interpretation of organic diversity. The book looks in detail at both Charles Darwin’s theories and Alfred Russell Wallace’s theories of about plant and animal species and raises the question of the context of Darwinism and that of Plato’s and Aristotle’s understanding of species.